Queen Victoria's Visit to Killarney and Muckross House, August 1861. A dramatised account of Queen Vitoria's visit can be heard here. 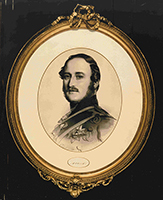 he Herbert Family of Muckross enjoyed a high social standing, which reached its climax in 1861, with the visit of Queen Victoria to Killarney. Although the Queen had visited Ireland on two previous occasions, in 1849 and 1853, this was the first time that Kerry was included in her itinerary. The Queen was accompanied by Albert, the Prince Consort, the Prince of Wales, Prince Alfred, Princess Alice and Princess Helena. The Royal party stayed the night of Monday, 26 August, at Killarney House, home of the Earl of Kenmare. 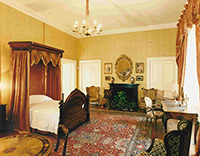 They then travelled on to Muckross, where they spent the following two nights. The Queen's visit to Killarney House was very much a state occasion. However, her stay at Muckross was a much more private affair. The local press reported that Her Majesty'had declared her intention of being "very quiet" while at Muckross.' (Kerry Evening Post, Wednesday 28 August 1861). in 1819 and married Queen Victoria in 1840. He died of typhoid in December 1861 Albert Edward (1841-1910), Prince of Wales. At 6.30 pm on the evening of Monday, 26 August, the Royal train arrived in Killarney from Dublin. The Royal party were then escorted to Killarney House, where a large dinner was held that evening. The next day the Queen embarked at Ross Castle for a day on the Lakes. Lunch was served at Glena Cottage. In the evening the party returned to Ross Quay, from where they were escorted back to Killarney House. in this house, known as Killarney House. At about 6.30pm that same evening, Tuesday 27 August, the Queen and her family set out for Muckross. They were accompanied by The Right Hon. Henry Arthur Herbert, Viscount Castlerosse (of the Kenmare family) and a troop of the Royal Dragoons. The Times described how Mr and Mrs Herbert received the Queen on the lawn at the door of Muckross House. A host of other ladies and gentlemen were also present and greeted the Queen enthusiastically. (The Times, Friday 30 August 1861). Muckross House, 1861, immediately prior to the visit of Queen Victoria. Elaborate preparations had been carried out at Muckross for the Royal visit. Tapestries, mirrors, Persian carpets, silverware, musical instruments, linen, china and servants' uniforms, are all said to have been specially commissioned for the occasion. 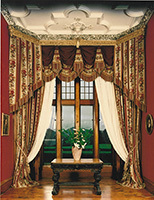 The curtains, which still hang in the Dining Room of Muckross House, were specially woven, probably in Paris, for the occasion. (Kerry Evening Post, Wednesday 28 August 1861). The following day the Queen, accompanied in her carriage by Mrs Herbert, drove around the Muckross Demesne, visiting Dinis Island, Mangerton and Torc waterfall. Following lunch at Muckross House, the party then embarked at Muckross boathouse for Tomies to view a stag hunt upon the Lake. (Kerry Evening Post, Saturday 31 August 1861). Before departing from Muckross, the Queen sent for Mrs Mary Herbert and presented her with a bracelet of gold, pearls and diamonds. 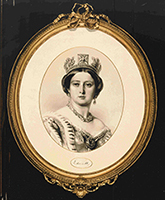 Her daughters, Eleanor and Blanche, also each received a piece of jewellery. 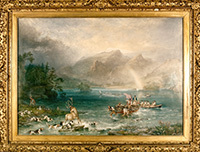 The Royal Collection at Windsor Castle contains three water-colours by Mary Herbert. Presumably Mary presented these to the Queen on her departure. At noon the Royal party left Muckross House for Killarney Railway station. There they boarded their train for Dublin, which they reached in just a little over five hours. Mr Miller, Chief engineer of the Great Southern and Western Railway drove the train both to and from Killarney. (Kerry Evening Post, Saturday 31 August 1861). 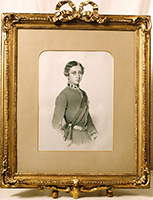 The unstable financial situation of the Herberts in the late nineteenth century may have stemmed from the outlay involved in preparations for this Royal visit.